Midweek City Run - Yes You Can Get Out Of The Office!! 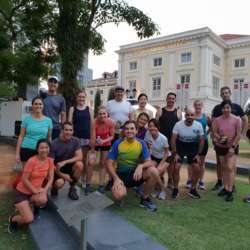 You must be a member of the Singapore Runners Group to attend this activity. Would you like to join this group? Join us for a mid week easy 5 or 10 km run to burn some calories. We will run to Esplanade, Helix Bridge, out and back to Marina Barrage, around Marina Bay and back to the start/finish point via the Merlion and Jubilee Bridge. Shorter options available. Dinner and drinks after the run if you are interested.